Mekanotaenia praecox common name praecox rainbow, or neon dwarf rainbow. They can grow up to 8 cm / 3 inches fully grown. They live in water parameters of PH range 6.0-7.5, temperatures of 22-26 Celsius / 72-78 °F. Neon dwarf rainbow fish are a playful fish so they are best kept in groups. They are usually peaceful so you can mix them with small size community fish. However not to small. 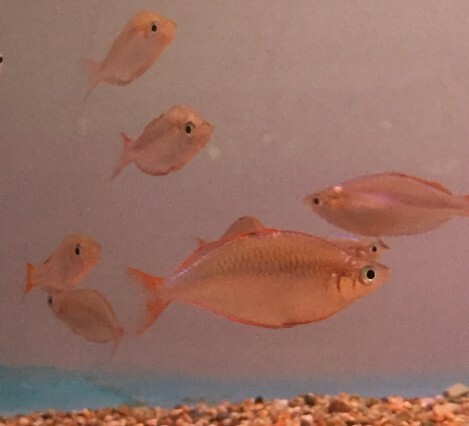 The neon dwarf rainbow are very quick moving fish so they can also be mixed with bigger fish. They may have large mouths but their throats tend to be narrow, so small pellets or granular foods and flake are best for them. With treats of live, or frozen foods. Dwarf rainbows have very small mouths so only require small size foods. They will eat anything you put in for them and they do like live and frozen foods as treats. We would recommend feeding dwarf rainbows once a day at the most.